You know how I told you that I can make laundry fly down the hall if I throw myself at it just right? Well, this morning I was very wound up and decided to try it. As a warm up I raced around the house first, paying special attention to the stairs. I finally reached the required velocity and propelled myself one last time up the stairs, around a wide circle in the master bedroom, and then launched myself at the upstairs railing where two neatly folded blankets were hanging. I grabbed at them as I bounded off the railing and down the hall. Lady Lynn had been folding laundry and saw the whole thing. She was very impressed and got a picture right away. These blankets have not been moved or altered in any way. They are just the way they landed! You can see, at the right of the picture, the railing (the white thing I'm walking past). 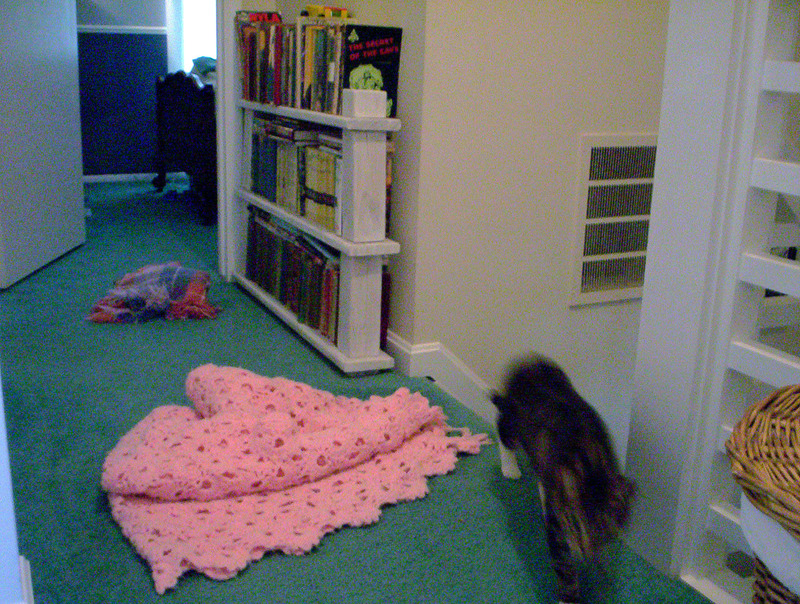 Please notice that while the heavy pink blanket didn't make it very far, the lighter weight blanket made it nearly into Boychild's room! A nap in the sunshine with my favorite book near at paw. First you need to type in what you want to say. Second, make sure you proofread your post. Paws are bigger than fingers making it very easy to hit more than one key at once! Don't be afraid to use the spell check function Blogger provides. Next, remember to click the "Publish Post" button. This is a fun part because you get to play with the mouse! Lastly, it is very important to take a nap. Blogging really tires you out. Wow, it was laundry day! I love sorting laundry. It's great fun to pounce on the high piles of it in the hallway. If you get a good enough run at it, and hurl yourself just so, you can make the whole pile topple over on top of yourself! Laundry day also gives me a chance to show the wicker laundry basket who's boss. Oh, and the best part is making the bed! Don't you just love it when the air billows the sheets? All those wonderfully elusive pathways! Why is it Lady Lynn thinks afternoons are a good time to do laundry? Four of us were on the bed when she decieded that it was the perfect time to change the sheets! What an inconvience. All well, I notice she took the time to fill the bird feeders first, so at least there is something interesting to watch. I was a little feral cat. Now I am a big house cat. I was born in the dawn of the new millennium. I spent a very cold winter looking in at the warmth, and comfort of Ashton Hall. The family gave me food and a cozy bed on porch. I would watch them until I couldn’t keep my eyes open any longer. In February of 2001 the family coaxed me inside with warm milk, and after the first few terrifying days, I have never looked back. Being the youngest, and the only male cat in the house, I spend a lot of my time begging forgiveness and mercy from the other cats. My hobbies include: watching the family from a safe distance, performing tricks for treats (I can sit up on my back feet for cheese), licking/tasting things, sleeping, eating, perfecting my pitiful “ow” meow, and generally acting subservient (I’m really good at that). I don’t really have a domain, but sometimes my Aunt Freckles lets me share her blanket. My favorite place is the couch, and anywhere in my young mistress’ room. I was a feral cat. I think I am about eight years old. I like to read things. I hear the voices. I like my catnip shmousie toy. I have a soft blanket in the corner by the bookcase. Scoot over, it's my turn! I am the Graceful Bulldog. The family claims they named me that because I’m not graceful at all, but that doesn’t make sense does it? My mother is Socks (I have inherited her long claws), and Riker is my sister. My hobbies include: sleeping, eating (I can hear a kitty kibble pellet hit the bowl from anywhere in the house), puffing up my fur to show my happiness, purring, bird/squirrel watching, and prowling (my claws make a very cool clicking sound when I walk across the floor). Like Riker I am only six years old, but I am big enough and strong enough to qualify for prime real-estate on the master bed. My favorite place is on my Mistress’s lap every morning (I have to compete with a book with B I B L E written on it, but she makes sure I have room), or sitting on the cedar chest looking out the window at the garden. My name is Riker, and if you think I’m a boy, you’re wrong! When my mother (Socks) had us kittens, the family didn’t think they could keep us. So, they called us by number as we came out. They named me Number One because I popped out first! :) After six weeks of calling me Number One, and discovering that I was going to remain with them for some time, they decided to give me the designation of Riker. Supposedly someone on TV named Captain Picard, called his first officer Number One. The family decided that since the first officer was a boy (and I’m a girl - as I mentioned earlier! ), that they would give me his last name. . . Riker! Let’s see, where was I? Oh! My hobbies include: chasing the ever illusive creature made of light, exploring (especially the mysterious, dusty, depths of the attic), playing with my favorite koosh ball, mooching food (family food), creating diversions during school, bird/squirrel/bug/pencil/emory board/etc. watching, oh, and sleeping. Personal goal in life: protect family from insurgent wicker baskets by destroying any that enter the house. I’m six years old, but everyone still treats me like a kitten. If you hadn’t noticed though I’m really outgoing, so I claim everywhere as mine! I defer to no cat! 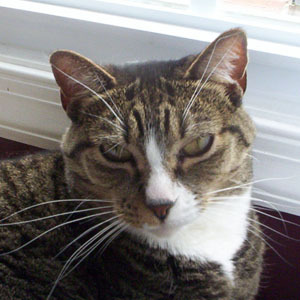 (Unless of course they smack me on the head... or hiss at me) My favorite place is: I have lots of favorite places! I like the Boychild’s bed, that is my spot! But, I like desks too, especially during spelling or math tests. As everyone likes to remind me I am a feral cat that has given up my wild ways, and gratefully embraced home life. I have been with the family for six years. They brought me inside just a few days before I had my kittens. My hobbies include: eating, sleeping, squirrel watching, and scaring the family by hiding in the closet. Humans confuse and intrigue me. I love having the tall bearded one near by, and pride myself on knowing what time he should be getting home each day. As the second oldest cat, I claim a large portion of the house as mine, but of course defer to the Lady at all times. My favorite place is the bathroom. I am the Lady of the Hall. I have been with the family the longest, eight of my fourteen years were lived without these other silly interlopers. My hobbies include: eating, sleeping, bird watching, telling it like it is, and chasing the mysterious creature that resides under the covers. As Lady of the Hall, I claim as my domain the entire house. My favorite place is at the head of the master bed.